MoneyRap Radio has assembled an array of Financial Experts in a variety of financial and commodity sectors who report the various financial news on a weekly basis. personally owned and operated KCHT-FM radio station in Central California, was the co-founder of the largest Advertising Agency in Kern County, California. 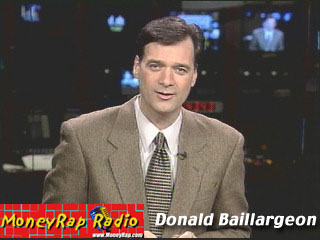 Donald Baillargeon is the founder, Executive Producer and host of MoneyTV, an internationally-syndicated weekly business television program reaching 170 million TV households globally. MoneyTV debuted in 1996 and produced and aired its 650th original weekly program in January 2010. Donald Baillargeon is also the Executive Producer and Host of Health This Week, a unique medical program dedicated to all matters relating to your health. Health This Week is seen in 90 million TV households worldwide. Donald Baillargeon is the host and Executive Producer of Stock Trend News Minute, a daily :90 vignette, airing in more than 120 million households.